Mt. Gardiner was on the list of half a dozen SPS peaks I had already climbed, but not as a dayhike. 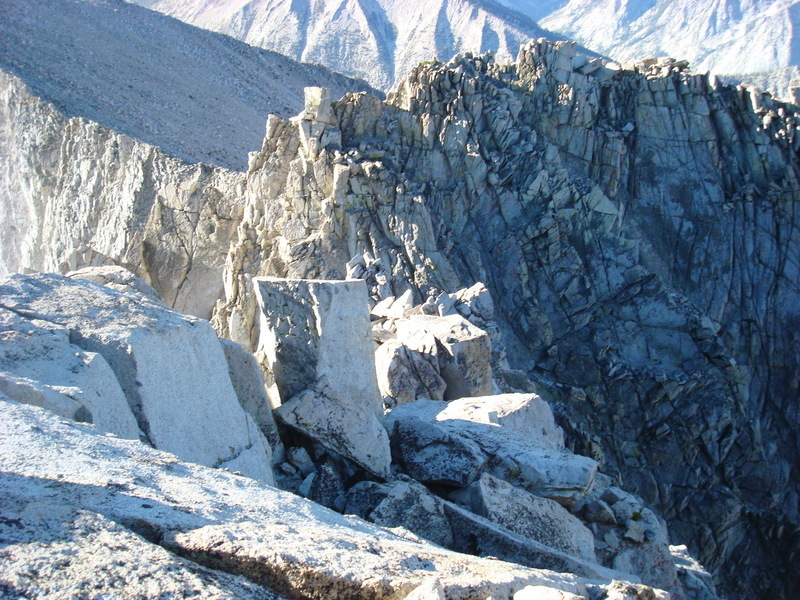 Though centrally located in the heart of Kings Canyon National Park, the peak is not too far from Roads End at the terminus of SR180. With something like 7,000ft of gain it would not be an easy hike, but one that could be fit into a 24hr door-to-door outing. Leaving San Jose at 8p, the usual caffeine-fueled drive across the state was executed without mishap in just under five hours. In the past few trips I would have gotten some sleep for a couple hours upon my arrival, but this morning I was rarin' to go. Maybe there was a bit too much caffeine on the drive. I headed out from Roads End just before 1a. It took about 2.5hrs to reach the cross-country turnoff along the Bubbs Creek Trail. Somewhere along the way I had come across a black, red, and white-banded milk snake on the trail, and stopped to photograph it. At the time I had no idea what kind of snake it was, and though I don't know of any poisonous snakes in the Sierra besides rattlers, I was afraid to pick it up. It was just like some terrorist to drop a lethal killer on the trail for an unsuspecting hiker to come across. Later when I showed the picture to son Ryan, he instantly identified it as friendly. "Red next to yellow kills a fellow, red next to black, friend of Jack," he recited. What? Where did he get that? Boy Scouts. I guess they teach some good stuff that I'd forgotten in my own youth. But I'm not sure I could have remembered it properly anyway. If I had to remember it in a crunch it would probably come out as, "Red next to yellow is mellow, red next to black - pending attack." And of course then I'd be no better off than my current ignorance. The milk snake was probably just as happy I didn't harrass him. When I came to Charlotte Creek I backed up on the trail and started looking for the use trail on the west side of the creek. I found a good-sized cairn to mark the spot, then headed off into the woods in that direction. I followed it up through the forest, losing one path, finding another, generally making good progress up the braided trail. The trail is primarily used by rock climbers heading to Charlotte Dome, so it was no surprise that it brought me to the lower rock skirt of that famous formation. Where my route needed to diverge to the right, I traversed across some wide granite slabs, then followed the right margin of the granite skirt higher, avoiding much of the scrubby bushwhacking to be found even further to the right. Pending daylight helped with this tricky section just as I needed it. It grew light as I emerged from the forest above Charlotte Dome, following the drainage northeast to the south side of Mt. Gardiner. Behind me the Great Western Divide rose above the south side of Kings Canyon, Mt. Brewer and North Guard catching the first rays of sunlight just before 6a. I stayed in the bottom of the drainage to take advantage of what grassy footing I could find among what is mostly an immense talus field. A stream trickled its way in a meandering path, sometimes disappearing altogether under the rock, but reappearing further up. Pockets of flowers grew amongst the grassy soil and in rock crevases, eking out an existence where none might be expected. A big advantage of my early start was that I got to stay in the shade for most of the climb. And few mosquitoes, too. Ahead of me to the north the sun had reached Mt. Gardiner's south summit (actually it was a false summit just to the left), and I now began the harder climb up through the boulders. I crossed some hard frozen snow just before the angle steepened, keeping things at class 2 without much trouble. The Kings-Kern Divide poked up above the ridgeline behind me as I neared the top of the south-facing slopes, and I was finally getting the feeling of being somewhere up high. It was 7:40a when I topped out on the south summit, the higher north summit looming a short distance away. It did not look as imposing as it had on my first visit eight years earlier, not surprising considering the amount of similar terrain I've tackled since then. To the east, I had a swell view of Gardiner Basin with its remote alpine lakes, Mts. >6898>Clarence King and Cotter lining the basin on the far side. Looking down the East Slope of Gardiner, I marveled at Matthew's tenacity to tackle Mt. Cotter after his climb of Gardiner a year earlier. I did not entertain any serious thoughts of duplicating that feat myself, content to leave Cotter for another day. Downclimbing to the notch between Gardiner's two summits, I paused to take a few pictures of the sky pilots growing quite happily among the rocky walls. I looked down the west side of the notch wondering if it could be downclimbed as an alternate return, but could not be sure since the bottom half was not visible from where I stood. It certainly looked interesting and worthy of some future exploration. I made my way along the connecting ridgeline, first on the left side, then moving around to the right of the ridge as it curved closer to the north summit. I came to the block where I had recalled making a somewhat sketchy finger traverse on that first visit. Others had reported no such obstacle. Guessing there must be another way around, I downclimbed a short distance on the right side of the ridge around the block, and sure enough found an easier way. Doh! And shortly after 8a I was once again atop Mt. Gardiner. The views were quite fine, the smoke that has been hanging over the state for the past several months was starting to dissipate. There were mountains in almost all directions, and had I taken the time I could probably have identified 50 or more summits scattered through Kings Canyon NP from my lofty perch. The register dated back more than 35 years, including many, many familar names both of those climbers I've met and many more that I have not yet had the pleasure to do so. Along with the two register books was Jerry Tinling's card that I had carried from the south summit where I found it on my first visit. Full of bravado (and mostly full of myself), I had made fun of Jerry for stopping at the south summit. Only later did I learn that Jerry was 72yrs-old at the time, and damned if I'm still able to climb to such remote places at his age. Still feel bad about that after all these years, I added a short addendum to my original note in way of appologizing for being a jerk. After about 30 minutes I started back, using much the same route I had on the ascent. I paused to take pictures of flowers, meadows, a grouse, and whatever else caught my fancy. Descending is so much more pleasant. On the east side of Charlotte Dome I again paused, this time to see if there were any climbers on the South Face, but saw none. It really is an impressive piece of granite and I paused often to get more pictures of it. Again moving along the eastern edge of the granite skirt, I failed to do the traverse across the slabs towards the base of the South Face as I had on the way up. I thought I would be able to more easily pick up a use trail below, tramping off in that direction as though expecting one to magically appear. That cost me some time and effort as I spent the next twenty minutes or so wallowing and thrashing through brush in all the "obvious" places to find a trail, but finding none. Eventually I had moved far enough to the west to pick up the trail, making much better progress from there on. It was 11:20a when I reached the Bubbs Creek Trail once again, leaving me with about two hours more to go. I passed by a small pack train heading upstream, none of the animals carrying any gear and probably on there way to retrieve some campers further up the canyon. As I got closer to the trailhead I came across more and more parties out for a hike. One had a group of more than 30 teenagers, only a few of them looking like they were having any sort of fun (an Outward Bound group, perhaps?). A small family party stopped me briefly, the woman asking me if they were almost up to where the "views opened up." I tried to explain that the trail follows the close-walled canyon for more than 15 miles and the views don't really open up, but she looked like she didn't believe me. Maybe she though she was on some other trail? Someone was in for a disappointment as they continued up the switchbacks. By the time I got back to the trailhead just before 1:30p, the crowds had increased on the trail and the parking lot was a bustle of activity. I don't recall ever seeing Roads End so popular, and here it was the middle of the week. After stopping by the car, I hiked down to the Kings River to take a quick dip in the cold water. It took some effort to find a place along the river not already occupied, but once seclusion was secured I was in and out of the river in ten minutes - refreshed, dressed, and ready for the long drive back to San Jose. Bob, that was mountain king snake near the beginning of the hike. WAY cooler than a milk snake (although since that is way outside the range of milk snakes, I guess a milk snake sighting would be pretty interesting).